Ha!!! Can you tell what's on my list for this morning? Trying to be sure last minute things will be ready for Christmas Day... we are all going to Heather & Keck's home this year! YIPPEE!!! I simply love, love, love getting all the kids and siblings together. Our children are a hoot when they are together... such funniness going on! Then we get to see the little ones open their gifts...which goes MUCH, MUCH, MUCH to fast! Boom... before we know it - all the gifts are open and they are ready to play! Do you remember getting gifts when you were little? Oh how I wanted my packages to be toys! I wasn't in to getting clothes ... I wanted TOYS!! I'm still a kid at heart and love fun toys. Give me a Nintendo or Xbox game along with the controller and I'm a happy girl. Did you know I love to play games like that...? Oh Yes... I get addicted to them. Jack used to get me a game every year and I was allowed to open it on Christmas Eve so I could play!!! Ha!! Look at this cake.... I think it's so cute now... young parents are having little parties with their immediate families to let them know if they are having a boy or girl... they do all kind of cute things! Two of my sewing friends are having babies arrive soon and they both are doing this type of "reveal"... that's what they call them "Reveal Parties". 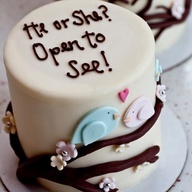 They will cut into this cake and it will either be pink or blue! Now... if it's pink AND blue... twins... one boy and one girl!!! Gosh... I wonder what they do when they have more than two babies that are on their way? Look at this Christmas ball... it's made from coffee filters and tinsel pipe cleaners. I was going to make them.. I love them...stained with coffee... I'll bet they smell yummy. I went to the site to get the instructions...well... it was simply TO MUCH WORK for me!. I decided to pass and let you admire this photo instead! You know...there are just some projects you must say NO too...this was mine! I've decided this is one thing I'd rather write a check for than to make. You know... 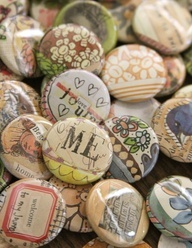 I simply adore covered buttons! My mom used to make them all the time and use in her clothing or sewing projects. I've just decided I need to do more with them. I mean... here you have the perfect item to make it absolutely the way you want... no searching every button store for the right button! They are making some of the cutest crafts with them.... 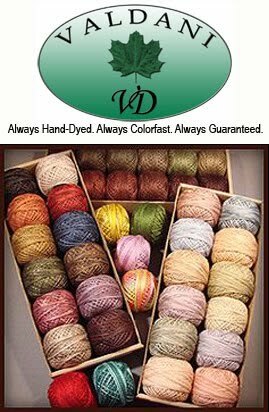 I'm getting my order ready today and moving on to a new endeavor! You just may be seeing some new projects!!! Isn't this clever? At first when I saw this... my thoughts were... oh yea...! they are cheating on the "finding" of 4-leaf clovers...they are making their own instead!!! But alas... that was not the case.. they are showing you how to make clover from using a paper punch and spinach leaves... these were to decorate a pretty dish they were serving. Gosh... just think of the fun shapes you can make using the paper punches... use cabbage leaves... kale... anything large and flat enough. hhhhmmm... this may be something to explore even further! Now...this is my kind of sign.. instead of getting out in the cold and making your snowman... just post this sign! I thought it was pretty clever and FUNNY!!! This toooooo.... .is a great idea. I used to have my long rolls of wrapping paper on the top shelf in my coat closet... then... when I wanted them they were very handy. Well.. they would all want to fall out on my head...so that didn't work. Then I lined them up very neatly along the floor - on the side of the closet. No...that didn't work either... every time I got in there for something...they all wanted to fall over. They are now in a tall plastic trash can which works very well. However, this is a super idea also! 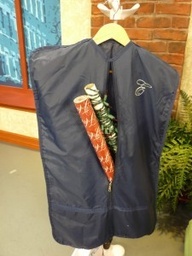 Simply fill up the suit hanger and put it in your closet. Aren't I adorable...? Won't you please take me for a ride? Please... please.... 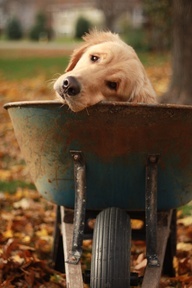 I love riding in the wheelbarrow! Look at those eyes... how could anyone say no to this sweet fellow! Well... I'm leaving you.... time to throw another load of clothes in the washer... Where do they all come from? I swear we didn't even own this many clothes! ARG!!! Friday morning is when everyone signs up for their classes and registers for their rooms for our Camp Blanding Retreat... 5:00 am!!! We do it early so they can get signed up and on their way to work! Once gal asked me why I do it so early... she hates getting up that early. I told her... we all hate getting up that early...but it's so the "working" girls get a fair chance at the rooms of their choice. You know.. .. we all have to play fair! I'll be hitting the sheets early Thursday night!